1. The wowbb can be purchased from: http://www.wowbb.com/. 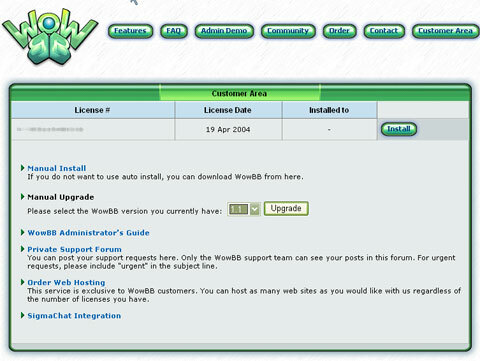 After you purchase it, login the customer area with the login and password that you received from wowbb company. Click manual install and download the zip package version. 2. Un-zip the package to a directory under your web document root directory. For example, if your web document root directory is c:\inetpub , extract the zip package to c:\inetpub\wowbb. Note: If you simply use 'wowbb' as the name for installation sub-directory, then we will not need to edit the config file. 3. Preparing for the run-time environment. [ready] web server : The latest version of RaidenHTTPD. [ready] php processor : The php processor is included in the latest version of RaidenHTTPD. [required] mysql : The mysql is not included in RaidenHTTPD; you need to manually install it. 4. Open an instance of Internet Explorer. and you should see this screen. Click 'New Installation' to start the setup process. 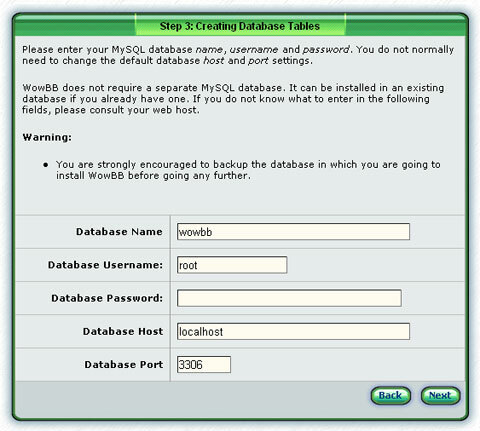 Enter the database name that you just created, 'wowbb', your mysql server address, and login/password. Enter a set of your desired administrator username, password and email info here. The installation for wow is now completed. 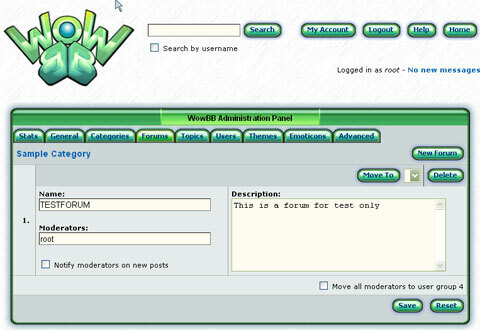 Go to the admin area and click forums to create a new forum. Enter the name, moderator (the user who is the master of the current forum) and the description of this forum, and click save. Now your forum is ready for use. 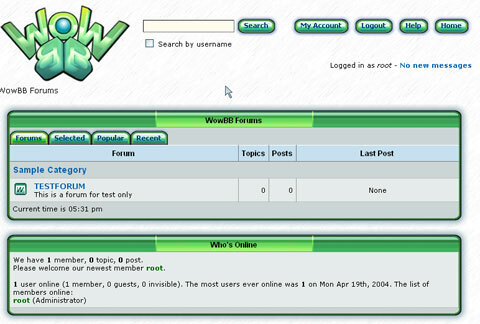 You may go to the url of http://YOUR_SERVER_IP/wowbb/ to see how the newly created forum looks like. Click on your test forum and try to post a new topic. Your post has just been published! Now, ask some of your friends to visit your forum!